Calling all tacos lovers! This recipe will definitely become one of your favorites and you will understand why Mexican Barbacoa is the best! 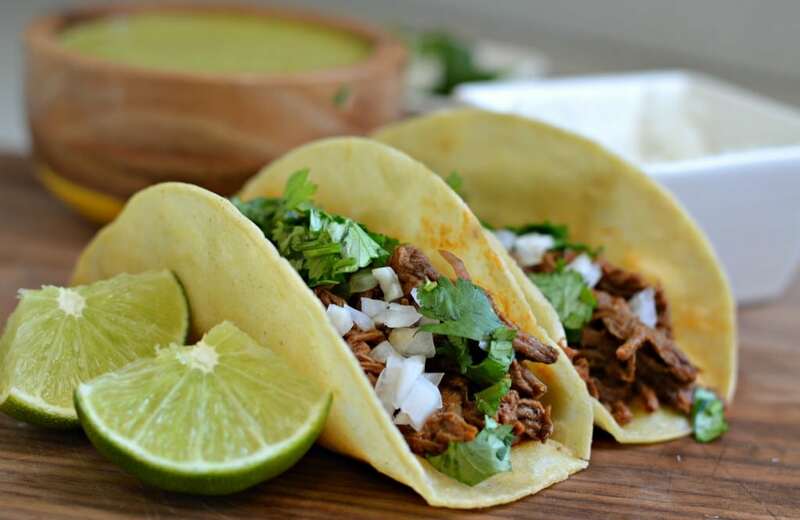 Beef barbacoa is a very traditional Mexican meal that almost always makes an appearance at birthdays, baptisms, weddings, sports events, and more. To be honest, it’s pretty easy to come up with a “reason” to make it. Even though there are many different ways to make barbacoa, my favorite is with tacos. So what makes barbacoa so delicious? It’s simple – the combination of dried chilies and spices, and the tender and juicy texture make it irresistible! Have you ever asked yourself what those dried chilies that you see at the grocery store are used for? This recipe will give you one answer. 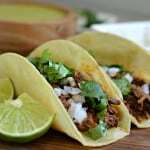 On the internet, you can find tons of different barbacoa recipes, and you will also find that lots of people will complain that it is not the original way that it is supposed to be made. 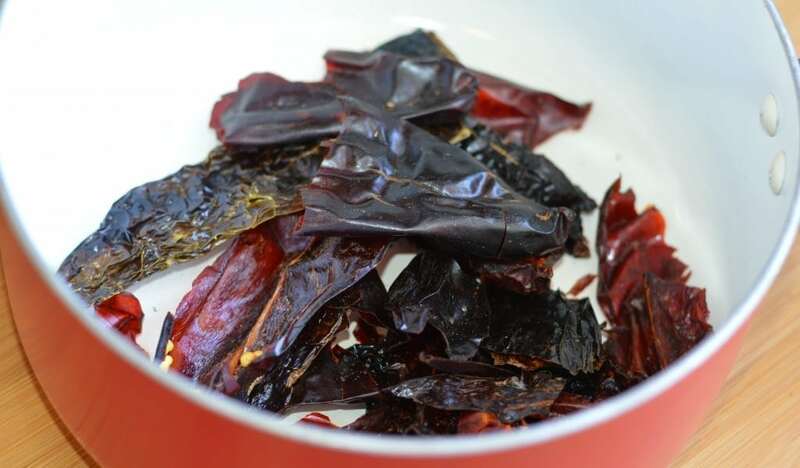 While I do believe that it is fine to make it in different ways, all authentic Mexican barbacoa recipes have to have dried chilies. I know that using these chilies in a recipe may seem intimidating at first. Don’t worry though. After reading this post, you will be an expert at preparing authentic Mexican barbacoa. 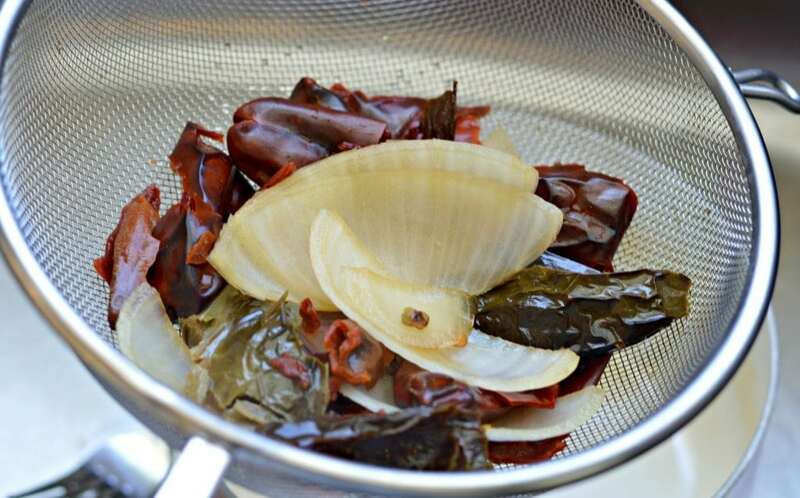 To soften the dried chilies, first you need to take out the seeds and the stem. Once removed, add them to a pot or pan with 1 cup of water, 3 cloves of garlic, 1 tomato, and 1/4 of a large onion. Then let boil for 5-7 minutes before draining the excess water. Next, add the mixture to a blender and add 2 tablespoons of white vinegar, salt and pepper to taste, and 1/4 cup of beef stock or water. Once everything has been blended together, pour the entire mixture through a strainer directly onto the shredded beef (cooked separately – see recipe below) and let it cook for at least two additional hours). That wasn’t so hard now was it? Believe me, the sauce makes all the difference between a sub-par barbacoa and a flavor filled Mexican barbacoa. Also, don’t worry – the dried chilies aren’t very spicy at all, so this is not a spicy recipe. 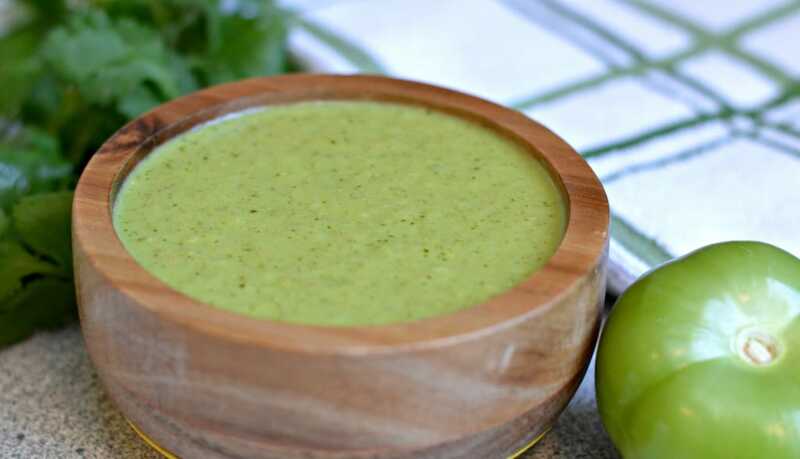 If you like it spicy though, be sure to accompany it with a delicious salsa verde. This was definitely one of my husband’s favorite meals when we visited Mexico, and as they say, the best way to a man’s heart is through his stomach. Without a doubt, that was true for us! 10 Guajillo chiles or California chilies as you will find them in the US. Combine all of the marinade ingredients and pour over the meat. Put in the refrigerator over night. Place the meat in a slow cooker, and dispose of the marinade. Add juice from 1 orange, mixed with the juice from 1 lime and a small amount of white vinegar. Then add the salt, pepper, cumin and oregano, and finally the bay leaves, the thyme, and the avocado leaves . Cook on the high setting of your slow cooker for 3 hours or until fork tender. 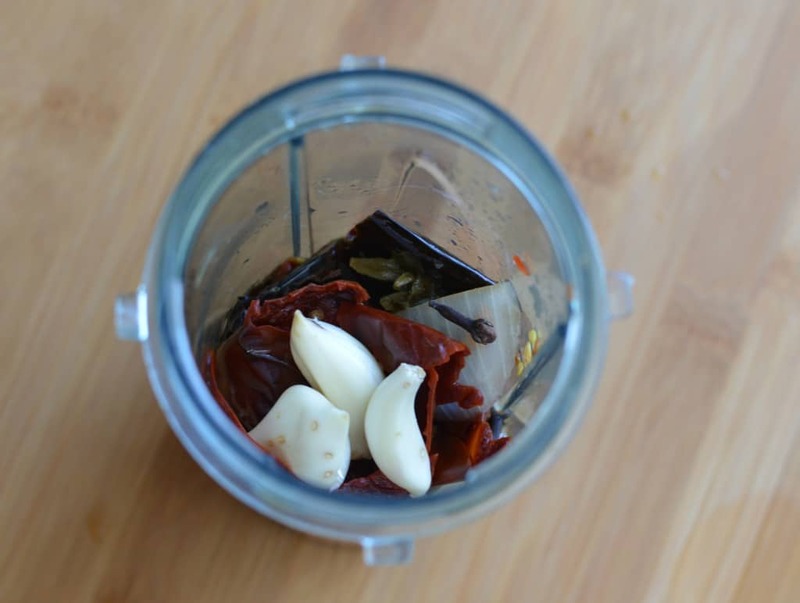 In a small pot, cook the chilies, the tomatoes, the garlic, and the onion in one cup of water (as shown in the post), blend together and pour through a strainer directly onto the shredded beef. It helps to use a wooden spoon to push down on the mixture so that as much liquid as possible comes out of the strainer. You can use some additional water if the mixture is too thick to strain. Cook on the medium setting for 1-2 more hours. How much liquid is there suppose to be after the ingredients are blended and strained? because i got a thick paste that is slowly draining the liquid. 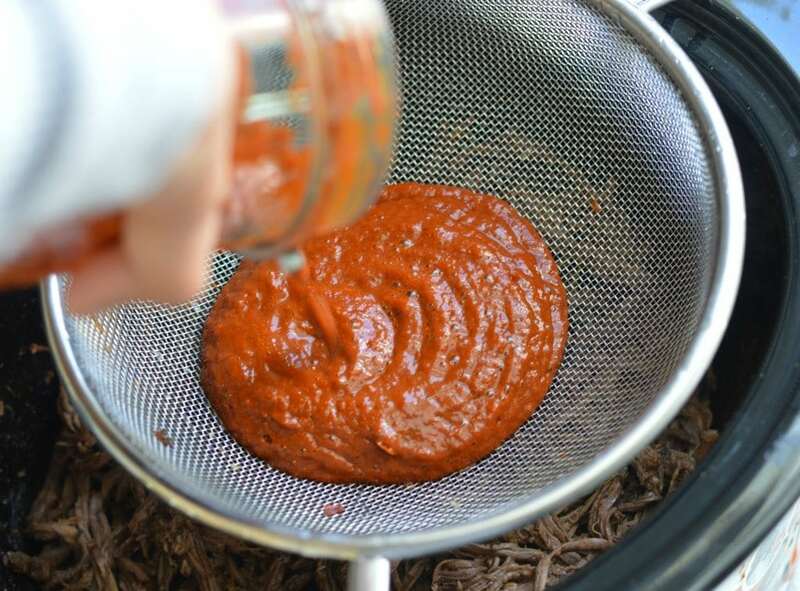 I use the water from the chilies (or the water from the meat) and pour into the strainer with the chilie “paste”. and push with a spoon. It should be tablespoon. I just updated the instructions to clarify. Thanks! 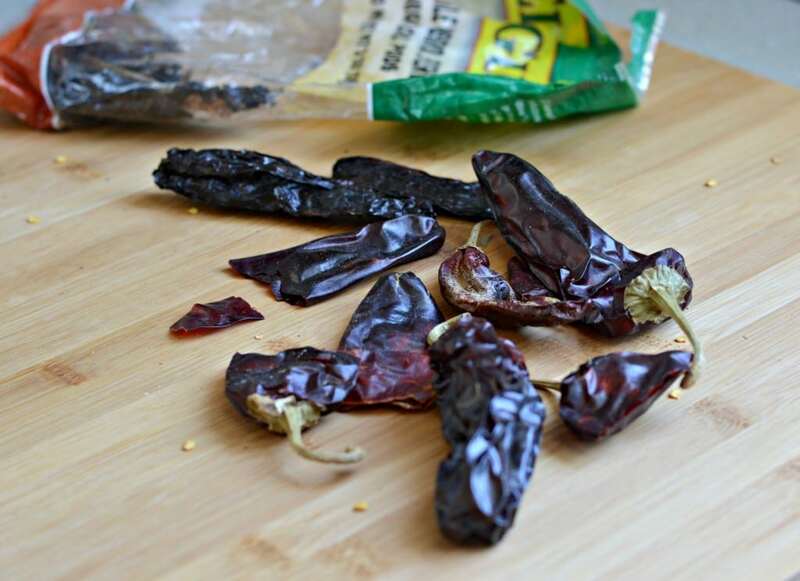 Are you using fresh or dried chiles? This uses dried chiles. Let me know if you have any more questions. Do you remove the liquid from the slow cooker after you shred the meat? Just a warning: I wrapped mine in a banana leaf in the slow cooker, and it extended the cooking time by almost double. Guess we’re having dinner at 11pm tonight!